Fusion Blogger Template is an elegant and simple blogger template with clean and robust layout, this template is mostly suitable for news, magazine, fashion and tech niche blogs. 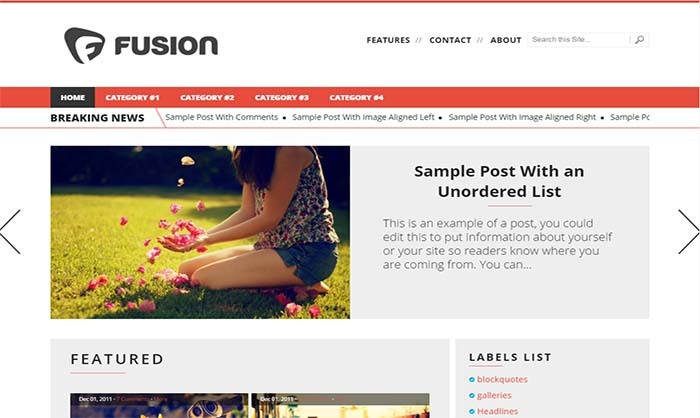 Fusion blogspot theme is 100% responsive and it is also compatible with most of the modern browsers. We have installed some valuable SEO plugins to make it more SEO friendly in comparison of other blogger templates. Fusion is preloaded with features like navigation menu, different featured posts and customized commenting system and more.Following are some of the key features of the Fusion Blogger Template.